Suncrisp Apples: Belleville's Best Kept Secret! We will begin picking Suncrisp apples October 2nd here at Eckert's! This variety is available exclusively at the Belleville farm only. Suncrisp apples are a hard, tart and long-keeping apple with almost an orange color. This apple ripens late in the season, but has a very firm and juicy flesh. This is the best apple for long-term storage! We planted the Suncrisp variety, on the advice of Mitch Lynd, Ohio grower and variety guru. According to Virginia State University, the Suncrisp apple is formerly known as NJ55. (Newly developed apples, which all begin life as a number, are named only after they are tested and ready for commercial sale.) Suncrisp was developed at Rutgers University by Dr. Fred Hough, a now retired fruit breeder. It is the result of cross-breeding Golden Delicious, Cortland, and Cox's Orange Pippin apples. Suncrisp are not the prettiest apple variety, and are not often sold directly to consumers because of their dull yellow color, and orange skin. Because this delicious apple has such a terrific qualities like firmness, delicious tart flavor, and long storage capabilities, it is used for a variety of items; baking pies and desserts, apple juice, apple butter, and apple sauce. Companies that produce items with apples as an ingredient love to use the Suncrisp variety because of their terrific flavor and excellent storage qualities. You have probably eaten hundreds of Suncrisp apples over your lifetime and didn't even know it! 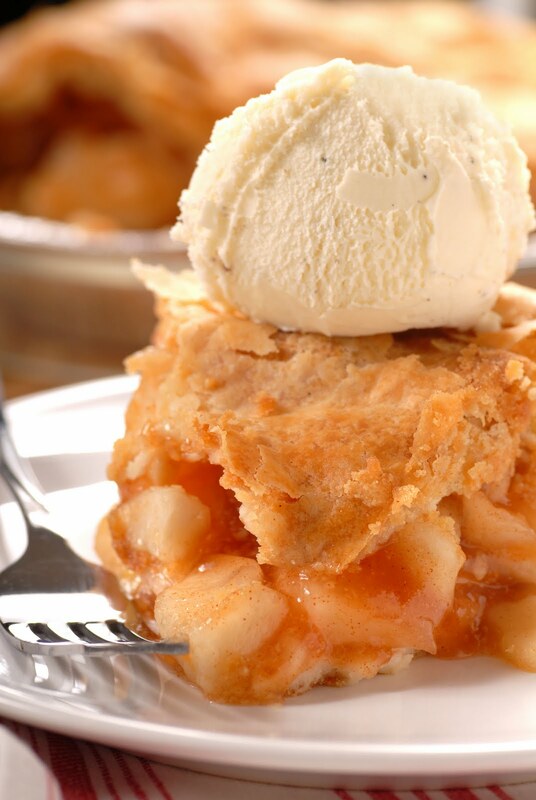 The weather is getting cooler and it is time for warm home baked pies! Here is a delicious "Apple Pie in a Glass" recipie that is perfect to use with Suncrisp apples. Peel, core and chop the apples. Crumble the cookies. Put the apples, sugar and cinnamon in a saucepan with 1/4 cup of water. Cook, covered, over medium heat for about 15 minutes. Remove the lid and cook another 10 minutes, until all the liquid is gone. Using half the cookie crumbs, divide them between 4 glasses. Spoon ice cream over them. Top with warm apple mixture and then with more crumbs.